With online shopping having become so popular, this time of year brings stories on the news about package thieves, as well as new gadgets to help deter someone from walking away with packages delivered while someone isn’t home. There are several options we have that can help keep our deliveries secure, as well as help from online retailers. Talk to neighbors that may be home during the days you’re expecting a package, and ask them to be on the lookout for a delivery to your home so they can hold it for you or stash it somewhere out of sight. There are simple ways to hide an unattended package: have a large plant to hide boxes behind, or use a lockbox at your doorstep, with key instructions for the carrier in your delivery details. Most large retailers will give you a “ship to store” option, and all you have to do is pick it up at the Customer Service desk. If your package is coming via USPS, there are several ways to divert package delivery, as well as ask a carrier to leave it somewhere out of sight. When you place your order, if you know you’re going to be at work, make sure your boss doesn’t mind if you have your items delivered to your workplace, and use that address for shipping. Your local pack-and-ship store will receive deliveries for you for a fee. Installing a visible security camera at your front door can deter some thieves, and some cameras come with motion-sensor options to set off a siren or other alert if someone gets too close to your front door. Amazon is offering several delivery options: Amazon Locker, Key Smart Lock Kit, Key In-Car Delivery, and Hub by Amazon. UPS offers My Choice to customize your deliveries. For FedEx deliveries, go to their Delivery Manager, create and account, and manage your deliveries. 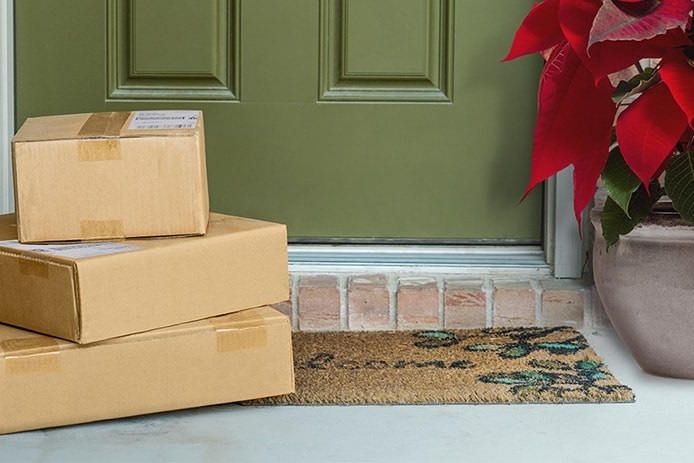 The best way to prevent “package Grinches” from stealing your deliveries is to be proactive. Use text message and email alerts, as well as specific delivery company smartphone apps to notify you when a package is left at your door.